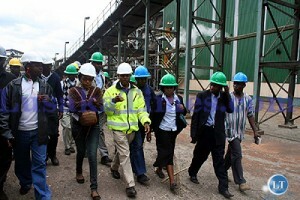 Zambia sugar Corporate affairs Manager Lovemore Sievu takes shareholders on a conducted tour of the sugar plant in Mazabuka. ActionAid, an activist group, said that ABF’s Zambian subsidiary paid more than a third of the company’s pre-tax profits out of Zambia into and via tax haven entities in Ireland, Mauritius and Holland. In a report released on Sunday, the non-governmental organisation estimated that Zambia had lost tax revenues of some $17.7m since ABF took over Illovo Sugar. AB Sugar has a 51 per cent stake in Illovo, which has operations across six southern African nations and owns Zambia Sugar. The Financial Times reports that the company attributed the zero corporate taxes to capital allowances. Zambia offers tax breaks as incentives to companies to invest and create jobs. While acknowledging some capital allowances, the ActionAid report said its investigation found that ABF’s Zambian subsidiary “uses an array of transactions that have seen over a third of the company’s pre-tax profits – over US$13.8m a year – paid out of Zambia, into and via tax haven sister companies. But John Bason, ABF’s chief financial officer, said of the money paid to Ireland, €4m was for expatriate salaries in Zambia and the £2m to Mauritius was for export services which Zambia lacked the capability to manage. ABF’s share of the dividend, €4m, is paid through a Dutch holding company. Zambia is among Africa’s poorer nations, with about 60 per cent of the population living in poverty, and the issues raised by ActionAid reflect concerns that multinational companies have been exploiting African nations. The group is part of the newly launched “If” campaign, which aims to tackle global hunger by closing tax loopholes. It has been put together by the biggest coalition of UK charities, campaigners and faith groups since the 2005 Make Poverty History campaign. Some African governments have offered sizeable tax incentives to foreign corporates in a bid to lure investment and boost development. But there are also criticisms that companies move profits offshore, taking advantage of the poor capacity of under-developed revenue authorities. In Zambia, Africa’s top copper producer, most of the focus has been on mining – which accounts for about two-thirds of the country’s export revenues – particularly since Michael Sata, a veteran populist politician, was elected president in 2011 on promises of more equitably distributing the nation’s wealth. In October, Alexander Chikwanda, the finance minister, said that this year the government would undertake a “holistic tax reform”, including a “diagnostic review of the entire tax system,” and a review of the tax incentives to promote equity. His government had previously announced measures to overhaul the mining tax regime and double royalties on copper mines. What is the so called govt doing abt this? These culprits should be brot to book. Anyway we shall investigate soon, once the kaponyas are thrust into the bottomless pit. Look, the short and sweet of it is this: ZRA and the GRZ does not have the capacity to monitor for tax purposes. They rely on corporations to declare as they wish and then agree like bobble-heads. Same goes for the mines and extractive industries. ZRA does not even know where to start. They don’t even know how allocate the funds received from the mines, calling them “unallocated”. Two thirds of tax due is not paid. Mines just throw 20 chartered accountants at poor ZRA dumb bells, pay a PSs off and hey presto they’re off. Now the OECD countries are clamping down on these coys in europe for evasion there but we still have our collective thumb in our arse. The bottom line is the issue. Shareholders are the scavengers of the poorest who are the employees of this company and many other companies who do not pay a fair tax to the host country. It is time the UN took notice and placed sanctions on the export of products from these poorer countries. That way products would not be able to be sent to foreign shores at huge profits for shareholders. It will hurt the workers, which is sad, but essential, to stop this disgusting company practice of whoring the host county and it’s cheap labour. the weak government would lose the little revenue in tax dollars and so a real deal would have to be done. I would love to be there to broker that deal with shareholders ,company executives and government officials and workers. Fat chance.